Ganesh Chaturthi marks the beginning of a 10-day long festival to celebrate Lord Ganesha’s birthday. During these ten days people of all caste and creed come together to celebrate enthusiastically, it truly is one of the most revered Indian festivals, which brings people together. 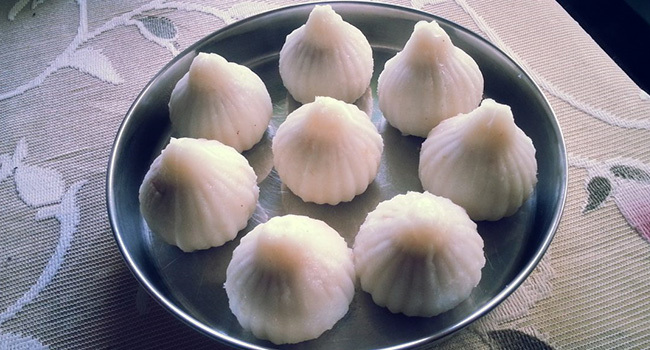 Over the next ten days people install Ganesha idols in their homes, pray to the lord and hold get-togethers where they sing songs of praise of the deity and eat his favourite food, which are modaks. During this festive period one cannot get enough of the traditional sweet dish, a plate of these translucent dumplings filled with coconut and jaggery are devoured within minutes and we’re going to tell you how to make the perfect modak. Heat ghee in a pan and to that add poppy seeds, cardamom powder and nutmeg powder. Sauté the same for a minute. Stir at times and cook this mixture till the moisture from the jaggery begins to dry. Switch off the flame and don’t overcook as the jaggery then hardens. Keep this coconut-jaggery filling aside. On cooling, the mixture will thicken more. In a pan or dekchi add the water, oil and salt. Keep it on the stove-top. Switch off the flame. Remove the pan from the stove-top and then cover this pan with a lid for 4 to 5 minutes. The dough will be hot when, you begin to knead, so apply some water on your palms and knead the dough. Remember to knead the dough very well. Make small balls from the dough. Roll the balls till they become smooth in your palms. Before you start shaping the modaks, keep water for steaming in a pan. Make all the modaks this way. Keep them in a steamer pan. Once the modaks are steamed, drizzle a few teaspoons of ghee on the modaks. Hope you get to try this recipe and if you do, don’t forget to share your photos of your perfect modak in the comments section below.